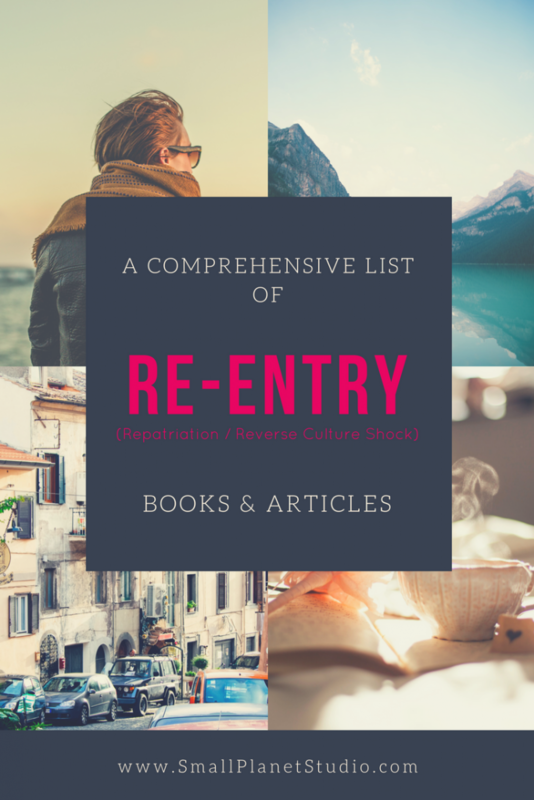 A member of our Facebook group asked for re-entry (repatriation/reverse culture shock) book recommendations, so I decided to make a master list! I’ll update this list as I find new re-entry books and articles. Got something to add? Contact me and I’ll add it to the list below! Note: I can’t vouch for any of the books or articles below except for mine. 🙂 Links in this post may be Amazon affiliate links, so if you purchase a book though my link SPS earns a very small commission. Thanks to Janet Botcherby, who is writing her Master’s thesis on re-entry, for the following literature review and articles. Adler, N. J. (1981). 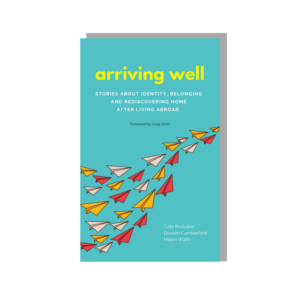 Re-entry: Managing cross-cultural transitions. Group and Organisational Studies, 6(3), 341–356. Adler, N. J., & Bartholomew, S. (1992). Managing globally competent people. Academy of Management Executive, 6(3), 52–65. Anderson, B. A. (2001). Expatriate management: An Australian tri-sector comparative study. Thunderbird International Business Review, 43(1), 33–52. Arthur, N. (2003). 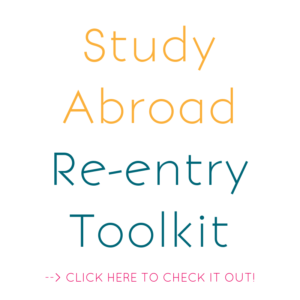 Preparing international students for the re-entry transition. Canadian Journal of Counselling, 37(3), 173–185. Arthur, M.B. and Rousseau, D. (1996), “A new career lexicon for the 21st century”, Academy of Management Executive, Vol. 10 No. 4, pp. 28-39. Bartlett, C.A. and Ghoshal, S. (1998) Managing Across Borders: The Transnational Solution, 2nd edn, Harvard Business School Press: Boston. Baughn, C. (1995). Personal and organizational factors associated with effective repatriation. In J. Selmer (Ed. ), Expatriate management: New ideas for international business (pp. 215– 230). Westport: Quorum Books. Black, J. S., & Gregersen, H. B. (1991). When Yankee comes home: Factors related to expatriate and spouse repatriation adjustment. Journal of International Business Studies, 22(4), 671–694. Black, J. S. (1992). Coming home: The relationship of expatriate expectations with repatriation adjustment and job performance. Human Relations, 45(2), 177–192. Black, J. S., Gregersen, H. B., & Mendenhall, M. E. (1992a). Toward a theoretical framework of repatriation adjustment. Journal of International Business Studies, 16(4), 737– 760. Black, J. S., Gregersen, H. B., & Mendenhall, M. E. (1992b). Global assignments. San Francisco, CA: Jossey-Bass. Bonache, J., & Brewster, C. (2001). Knowledge transfer and the management of expatriation. Thunderbird International Business Review, 43(1), 145–168. Bridges, w. (1991) Managing Transitions: Making the most of Change. Reading, MA: Addison Wesley. Caligiuri, P., & Lazarova, M. B. (2001). Strategic repatriation policies to enhance global leadership development. In M. E. Mendenhall, T. M. Ku ̈ hlman, & G. K. Stahl (Eds. ), Developing global business leaders: Policies, processes, and innovations (pp. 243–256). Westport, CT: Quorum Books. Campbell, J. (1968) The Hero with a Thousand Faces, New York: Bollingen Foundation. Chamove, A. S., & Soeterik, S. M. (2006). Grief in returning sojourners. Journal of Social Sciences, 13(3), 215–220. Cox, B. J. (2004). The role of communication, technology, and cultural identity in repatriation adjustment. International Journal of Intercultural Relations, 28(3–4), 201–219. DeFillipi, R. and Arthur, M. (1994), “The boundaryless career: a competency-based perspective”, Journal of Organizational Behaviour, Vol. 15, pp. 307-24. Forster, N. (1994). The forgotten employees? The experiences of expatriate staff returning to the UK. International Journal of Human Resource Management, 5(2), 405–425. Furukawa, T. (1997). Sojourner readjustment: Mental health of international students after one year’s foreign sojourn and its psychosocial correlates. Journal of Nervous and Mental Disease, 185(4), 263–268. Furuya, M., Stevens, M. J., Oddou, G., Bird, A., & Mendenhall, M. E. (2007). The effects of HR policies and repatriate self-adjustment on global competency transfer. Asia Pacific Journal of Human Resources, 45(1), 6–23. Gregersen, H. B., & Black, S. J. (1992). Antecedents to commitment to a parent company and a foreign operation. The Academy of Management Journal, 35(1), 65–90. Gregersen, H. B., & Black, S. J. (1996). Multiple commitments upon repatriation: The Japanese experience. Journal of Management, 22(2), 209–229. Gregersen, H. B., & Stroh, J. K. (1997). Coming home to the arctic cold: Antecedents to Finnish expatriate and spouse repatriation adjustment. Personnel Psychology, 50(3), 635–654. Gomez-Mejı ́a, L., & Balkin, D. B. (1987). The determinants of managerial satisfaction with the expatriation & repatriation process. Journal of Management Development, 6(1), 7-17. Gullahorn, J. T., & Gullahorn, J. E. (1963). An extension of the U-curve hypothesis. Journal of Social Issues, 19(3), 33–47. Hall, D.T. (1996), “Protean careers of the 21st century” Academy of Management Executive, Vol. 10 No. 4, pp. 8-16. Hammer, M. R., Hart, W., & Rogan, R. (1998). Can you go home again? An analysis of the repatriation of corporate managers and spouses. Management International Review, 38(1), 67–86. Kraimer, M. and Shaffer, M. (2004) ‘Examining repatriation success from a careers perspective’, Paper presented at the 64th Annual Academy of Management Meeting, New Orleans, LA. Kraimer, M. L., Shaffer, M. A., & Bolino, M. C. (2009). The influence of expatriate and repatriate experiences on career advancement and repatriate retention. Human Resource Management, 48(1), 27–47. Leiba-O’Sullivan, S. (2002) ‘The protean approach to managing repatriation transitions’, International Journal of Manpower 23(7): 597-616. Lazarova, M., & Caligiuri, P. (2001). Retaining repatriates: The role of organization support practices. Journal of World Business, 36(4), 389–401. Lazarova, M., & Caligiuri, P. (2004). Repatriation and knowledge management. In A. W. Harzing & J. Ruysseveldt (Eds. ), International human resource management (pp. 333–356). London: Sage. Lazarova, M. B., & Cerdin, J. L. (2007). Revisiting repatriation concerns: Organizational support versus career and contextual influences. Journal of International Business Studies, 38(3), 404–429. Lester, Joan Cost. (2000). Strangers in their own land: Culture loss, disenfranchised grief, and reentry adjustment. (Ph.D.), Antioch New England Graduate School, Keene, NH. Linehan, M., & Scullion, H. (2002). Repatriation of female international managers. International Journal of Manpower, 23(7), 649–658. Lysgaard, S. (1955). Adjustment in a foreign society: Norwegian Fulbright grantees visiting the United States. International Social Science Bulletin, 7, 45–51. Martin, J. N. (1984). The intercultural reentry: Conceptualization and directions for future research. International Journal of Intercultural Relations, 8(2), 115–134. Martin, J. N., & Harrell, T. (1996). Reentry training for intercultural sojourners. In D. Landis & R. S. Bhagat (Eds. ), Handbook of intercultural training. (pp. 307–326). Thousand Oaks, CA: Sage. Martin, J. N., & Harrell, T. (2004). Intercultural reentry of students and professionals: Theory and practice. In D. Landis, J. M. Bennett, & M. J. Bennett (Eds. ), Handbook of intercultural training (pp. 309–336). Thousand Oaks, CA: Sage. McDonald, G. M. (1993). ET go home? The successful management of expatriate transfers. Journal of Managerial Psychology, 8(2), 18–30. Nelson, J. (2005). The benefits of a formal repatriation program for the organization and the expatriate. Employee Benefit News, 19(14), 20. Oberg, K. (1960). Culture shock: Adjustment to new cultural environment. Practical Anthropologist, 7, 177–182. Onwumechili, C., Nwosu, P., Jackson, R. L., & James-Hughes, J. (2003). In the deep valley with mountains to climb: Exploring identity and multiple reacculturation. International Journal of Intercultural Relations, 27(1), 41–62. Osland, Joyce S. (2000). The journey inward: Expatriate hero tales and paradoxes. Human Resource Management, 39(2&3), 227-238. Paik, Y., Segaud, B., & Malinowski, C. (2002). How to improve repatriation management: Are motivations and expectations congruent between the company and expatriates? International Journal of Manpower, 23(7), 635–648. Pusch, M. D. (1998). In D. Lynch, A. Pilbeam, & P. O’Connor (Eds. ), Going home: Styles of reentry. Heritage and Progress, proceedings from SIETAR-Europa conference. Riusala, K., & Suutari, V. (2000). Expatriation and careers: Perspectives of expatriates and spouses. Career Development International, 5(2), 81–90. Rogers, J., & Ward, C. (1993). Expectation-experience discrepancies and psychological adjustment during cross-cultural reentry. International Journal of Intercultural Relations, 17(2), 185–196. Sahin, N. H. (1990). Re-entry and the academic and psychological problems of the second generation. Psychology and Developing Societies, 2(2), 165–182. Sa ́ nchez Vidal, M. E., Sanz Valle, R., Barba Arago ́ n, M. I., & Brewster, C. (2007). Repatriation adjustment process of business employees: evidence from Spanish workers. International Journal of Intercultural Relations, 31(3), 317–337. Schutz, A. (1945). The homecomer. American Journal of Sociology, 50(4), 363–376. Selby, Susan. (2011). Back Home: Distress in re-entering cross-cultural missionary workers and the development of a theoretical framework for clinical management. (Ph.D.), University of Adelaide. Selby, Susan; Jones, Alison; Clark, Sheila Elizabeth; Burgess, Teresa Agatha; Beilby, Justin John. (2005). 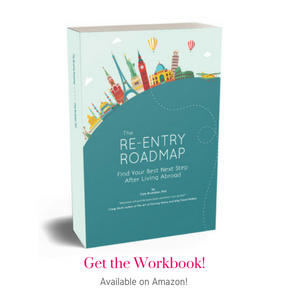 Re-entry adjustment of cross cultural workers. Australian Family Physician 34(10), 863-864. Stevens, M. J., Oddou, G., Furuya, N., Bird, A., & Mendenhall, M. (2006). HR factors affecting repatriate job satisfaction and job attachment for Japanese manage. International Journal of Human Resource Management, 17(5), 831–841. Stroh, L. (1995). Predicting turnover among repatriates: Can organizations affect retention rates? International Journal of Human Resource Management, 6(2), 443– 457. Sussman, N. M. (2001). Repatriation transitions: Psychological preparedness, cultural identity, and attributions among American managers. International Journal of Intercultural Relations, 25(2), 109–123. Suutari, V., & Brewster, C. (2003). Repatriation: Empirical evidence from a longitudinal study of careers and expectations among Finnish expatriates. The International Journal of Human Resource Management, 14(7), 1132–1151. Tung, R. L. (1998). American expatriates abroad: From Neophytes to Cosmopolitans. Journal of World Business, 33(2), 125–144. Arthur, M. and Rousseau, D. (Eds), The Boundaryless Career, Oxford University Press, NY. Westwood, R. I., & Leung, S. M. (1994). The female expatriate experience: Coping with gender and culture. International Studies of Management and Organization, 24(3), 64–74.